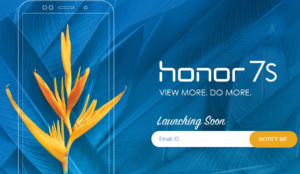 Honor 7S (claimed to be same as the Honor Play 7 launched in China in May) will be launched in India soon confirmed Honor (sub-brand of Huawei Technologies Co., Ltd. is a Chinese multinational networking, telecommunications equipment, and services company). The 7S has already been launched in Pakistan. The company is running a spin contest for users as well to win this smartphone, or Honor Play or Honor 9N or Honor Band. To participate in the contest, the user must register or log in. One year will get three chances daily to play and win Honor smartphone. A user also can avail one extra chance by sharing the game on social media. The event is live till 7th September and the winner will be expected to reply within 14 days with the required details to be eligible for the prize, as information provided on the website. Honor 7S is priced at PKR 14,499 in Pakistan (roughly Rs. 8,400). The smartphone bears a 13 megapixel rear camera sensor with PDAF and LED Flash while 5 Megapixel sensor at the front side. As the Honor advertises, the smartphone packs a louder earpiece for clearer voice calls. The model comes with runs Android 8.1 Oreo out of the box (as per the specs of the phone launched in Pakistan). The device is powered by a quad-core MediaTek MT6739 SoC coupled with 2 GB of RAM. The dual SIM (Nano) smartphone has a 5.45-inch HD+ (720×1440 pixels) FullView display. Users can store heavy files easily as the device comes with 16 GB of inbuilt storage which can be expanded up to 256 GB (via microSD). Honor 7S packs a 3020mAh battery. Sensors on board include the accelerometer, ambient light sensor, and proximity sensor. Connectivity Options: Wi-Fi 802.11 b/g/n with hotspot, GLONASS, GPS, 4G LTE, Bluetooth 4.2 with LE, Micro-USB, and a 3.5mm headphone jack. After Spin Contest, winners’ prizes would be shipped to the provided address. A user can only win once during the duration of the event. The Honor 9N has a price tag of Rs. 13,999, Honor Play is priced at Rs. 9,999 and Honor Band 3 is priced at Rs. 2,499.